It is believed that following its partnership with famed Parisian casemaker Verger Frères in the 1920s, Vacheron Constantin has since then infused a certain Mediterranean flair and Parisian chic to its timepieces, the present astounding reference 4072 in stainless steel and pink gold is a perfect example. The elegant combination of the two tone pink champagne dial paired with a steel case and pink gold bezel as well as chronograph pushers make the present watch a symbol of exquisite style and sophisticated nonchalance. In production from 1938 until the late 1960s the reference 4072 still exudes a highly contemporary elegance. Vacheron Constantin produced the watch with both the rare oval-shaped chronograph pushers, or as found on the present watch, with more modern, rectangular-shaped pushers. Furthermore, the 34mm case featured either a rare flat bezel or a beveled one. 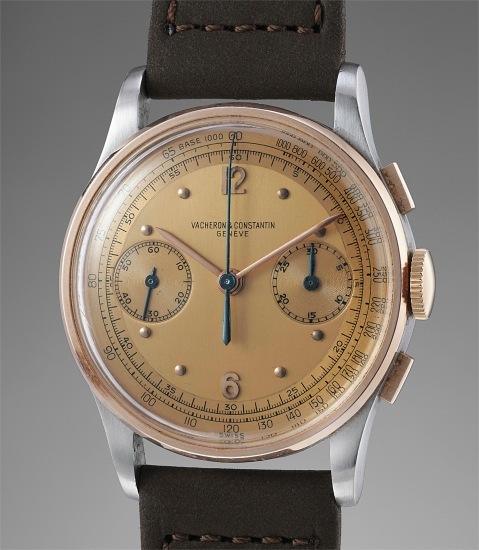 One of Vacheron Constantin’s most iconic and sought after vintage chronograph models, especially in the present combination of which less than 70 are known, this particular reference 4072 is distinguished by its immaculate case preserved in factory fresh condition. The case appears larger due to the elongated and powerful lugs as well as the wide dial opening. Scholars and connoisseurs consider Vacheron Constantin chronographs to be amongst the most beautiful ever made, offering exceptional quality, aesthetics and value. The present model is amongst the finest and best preserved examples of the reference to appear on the market in recent memory, making it a trophy watch for the connoisseur.